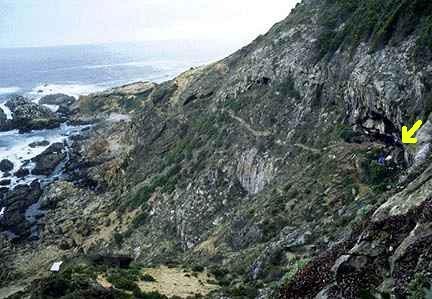 View of Indian Ocean and west of Blombos Cave entrance where yellow arrow points. Photograph courtesy National Science Foundation. Blombos Cave is 200 miles east of Cape Town, South Africa on a hillside overlooking the Indian Ocean. 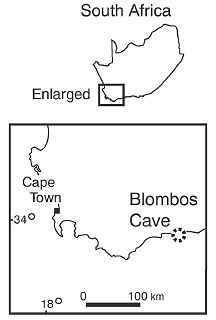 January 24, 2002 Blombos Cave, South Africa - On December 8, 2001, I first reported about the new archaeological evidence that "modern humans" lived in Blombos Cave, South Africa 70,000 years ago. (See: Earthfiles 12/8/01) This month the journal Science published a report by the lead anthropologist and discoverer, Christopher Henshilwood, Ph.D., Adjunct Professor of Anthropology at the State University of New York, Stony Brook, and the Iziko South African Museum in Cape Town.